The most powerful sustainability audit just got a lot more powerful. TULSA, Okla., October 20, 2015 / 3BL Media /- Caelus Sustainability Consulting (Caelus) announced today the release of the latest version of their comprehensive sustainability audit. They are calling the latest release the CurrentState™ Sustainability Audit 2.0. CurrentState™ is a consulting service that conducts the most comprehensive sustainability audit available in the market today for businesses. It takes a snapshot of the current sustainability policies, procedures and practices of an organization and compares these to a database of over 1200 Sustainability Best Practices (which spans 29 business categories). This information is gathered and analyzed and is included in a Findings Report. 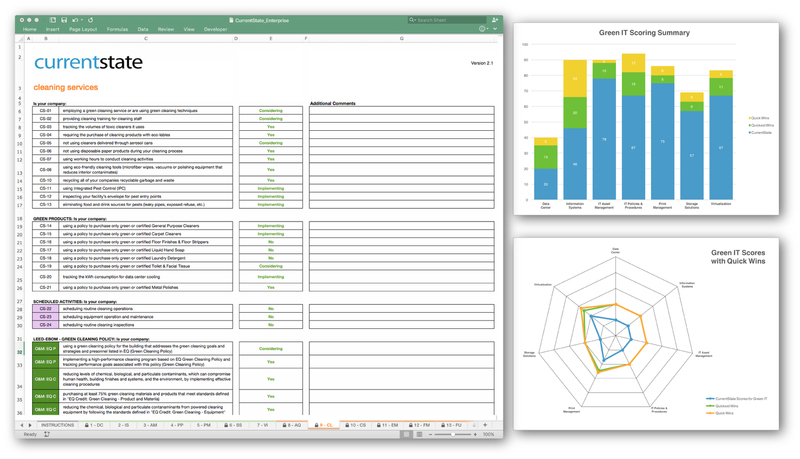 In-Depth Analysis - CurrentState™ conducts a Gap Analysis (compares current sustainability activities to all possible activities) and a Maturity Analysis (documents the extent to which activities are being conducted). From this information a sustainability consultant creates a ‘Sustainability Implementation Plan’ to improve performance across the entire organization. Clear, Concise Charts & Diagrams - The Findings Report contains clear and concise charts and diagrams. These include your Performance Overview, Category Summaries, Quick & Quicker Win Analysis and others. Quick Wins, Quicker Wins, Recommendations & Analysis - The Findings Report includes specific recommendations so your organization can begin improving performance on day one. All recommendations are in the form of ‘tasks’, so they can be easily organized into realistic and achievable projects and initiatives. What's New in the CurrentState™ Sustainability Audit 2.0? The CurrentState™ process is very simple. The process begins with a Sustainability Survey that captures your current sustainability activities. Once completed and submitted, a qualified sustainability specialist begins to analyze your submission and prepare a Findings Report. CurrentState™ is available in two versions - Small Business Version and the Enterprise Version. The Small Business Version is ideal for companies with fewer than 1000 employees. The Enterprise Version is for larger, more complex companies that have established sustainability programs and/or manage their own data centers. Caelus representatives are available to help decide which version is best suited for different companies. For additional information, please visit the CurrentState Product Page (http://www.caelusconsulting.com/current-state/) or contact Caelus directly at +1 917 485-1778. Caelus is a sustainability consulting firm based in Tulsa, Oklahoma. Caelus offers an extensive range of sustainability consulting services which includes the CurrentState™ 2.0 Sustainability Audit, VendorCheck™ Green Supply Chain services as well as many sustainability reporting services. Caelus also manages the CaelusGreenRoom.com sustainability blog.